This is a milk candy treat with a similar texture to taffy. 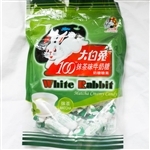 While the original White Rabbit candy has been around for many years, this one is a new flavor that's sure to please! Ingredients: Liquid Maltose, White Granulated Sugar, Whole Milk Powder, Butter, Matcha Powder (Tea Leaf), Matcha Flavour, Gelatin (Food additive), Edible Glutinous Rice Paper (Edible Corn Starch, Water, Glycerin, Monostearate).